We are not against that Sachin getting BHARATRATNA. It's most Happy moment for all Sachin Fans. But Who is Dhyaanchand & Why People asking to give him Bharatratna...? INDIA Won 3 Olympic Gold medals in Hockey. In Olympic Games We Played 48 Games and Wins all of them.! INDIA was Unbeatable in Hockey for 20 years. We defeated America in all the matches and since than America banned Hockey for the Next Few Years. Can you imagine what an achievement it was.! Shree Dhyaanchand was among those Who made Hitler his Fan and He requested to accept Germany Citizenship and play for Germany & in return he will get as much as Money and a he will be head of his Army.! but He refused saying he does not play for money but for Country.! How he made Hitler his fan..? When he went to Germany for Hockey World Cup he was injured by Germany Goal Keeper.! In return he Ordered his Team mates to take revenge..! Can you imagine someone challenging Germany citizen in front of Hitler..! This was the biggest shame for Germany and Hitler was impressed by his answer..! There was a match When he didn't Score a Single Goal. On this he argued with match referee that the Goal post length is short because I can't do a Goal. This was found correct and goal post length was increased & latter he scored 8 goals..! HE WAS THE ONLY INDIAN WHO HOISTED INDIAN FLAG BEFORE INDEPENDENCE NOT ONLY IN INDIA BUT IN GERMANY..! WE WERE RULED BY BRITISHERS AND NOT ALLOWED TO TAKE OUT FLAG BUT HE HIDE THAT IN HIS NIGHT DRESS AND TOOK IT TO GERMANY. IT REQUIRES A LOT OF GUTS.! ON THIS BRITISHERS ANNOUNCED IMPRISONMENT BUT HITLER DIDN'T LET THIS HAPPEN.! During his last time he became So Poor that he didn't had Money to have Food, again he was offered a Coach Post by America and Germany but he refused saying if he teaches Hockey to them than INDIA will no more be a Champion in Hockey. but our Govt didn't offer him anything & it was INDIAN ARMY Who helped him.! Once upon a time he went to see a Hockey match at Ahmadabad but was not allowed in Stadium Saying We don't recognize You..? That game was attended by Jawaharlal Nehru.! Finally Cricket Icon Sir Don Bradman said "I'm a fan of Dhyaanchand & he scores Goals more easily than I Score runs.!" 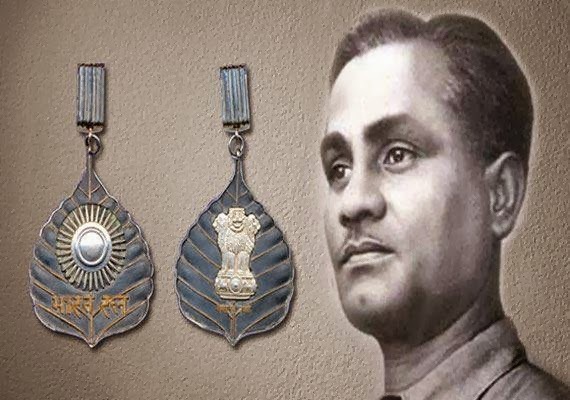 Do you think he should be the 1st Sportsman for whom all the rules should have been amended and awarded "BHARAT RATNA"
THIS IS SHOCKING HE IS NOT A BHARAT RATN AS PER OUR GOVT BUT MORE THAN 50 COUNTRIES HAVE AWARDED HIM WITH MORE THAN 400 AWARDS.